We recently took a family trip to Oregon to visit the Enchanted Forest theme park (click to read about our visit). 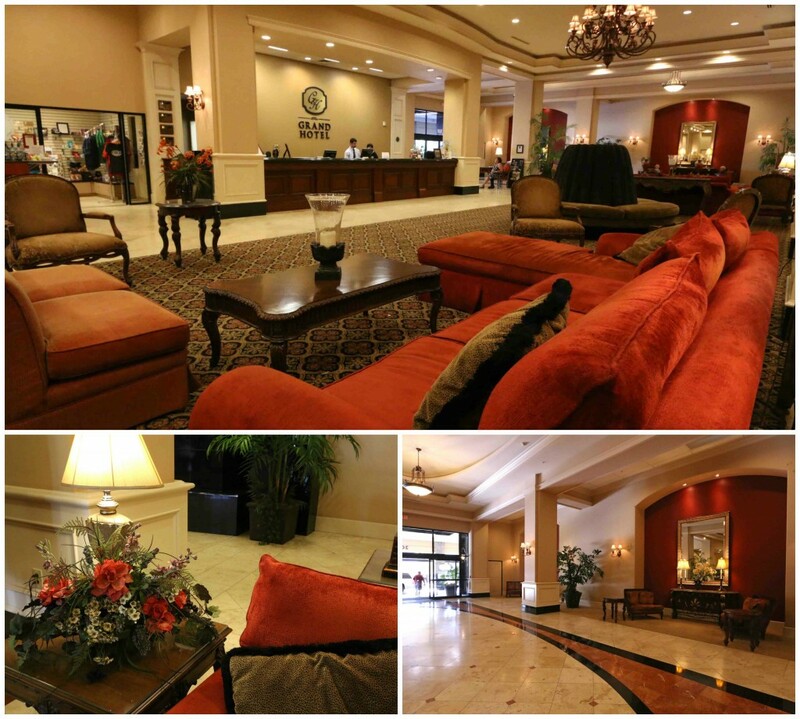 We stayed overnight at the beautiful 4-star Grand Hotel in Salem. 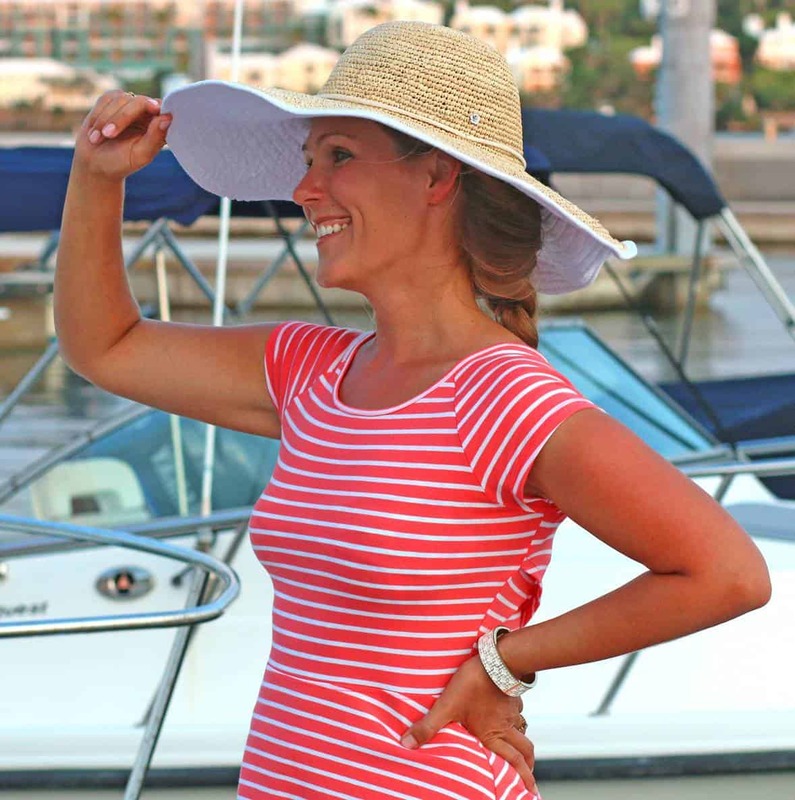 Let us take you on a virtual tour of our experience. 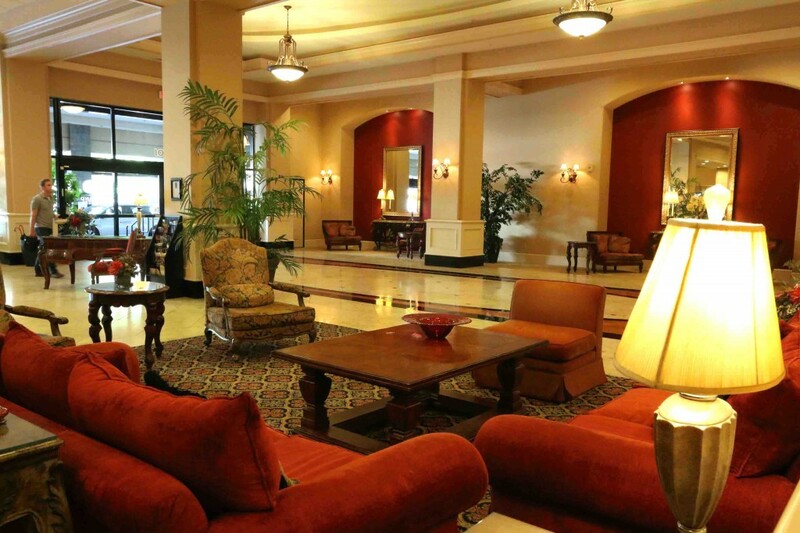 The most refined hotel in the Willamette Valley, the Grand Hotel is located in historic downtown Salem. 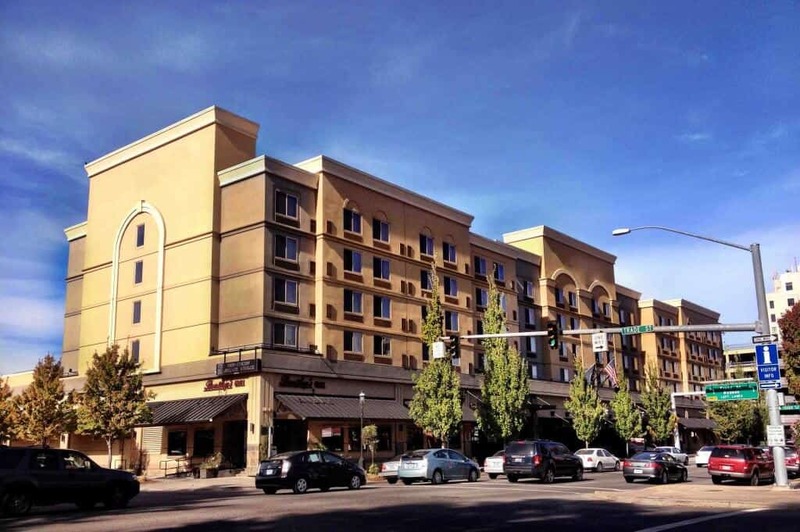 It is the headquarters for the Salem Convention Center and boasts 193 luxury guestrooms and premier suites. 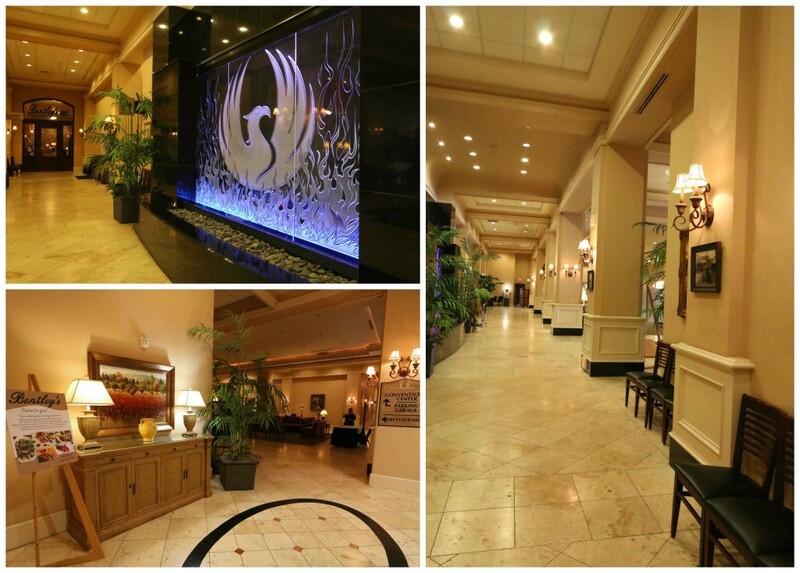 The hotel, its restaurant, and the convention center are all EarthWISE Certified, an impressive accomplishment. In fact, The Grand Hotel in Salem and Bentley’s Grill are the first hotel and restaurant in Marion County to have achieved this distinction. 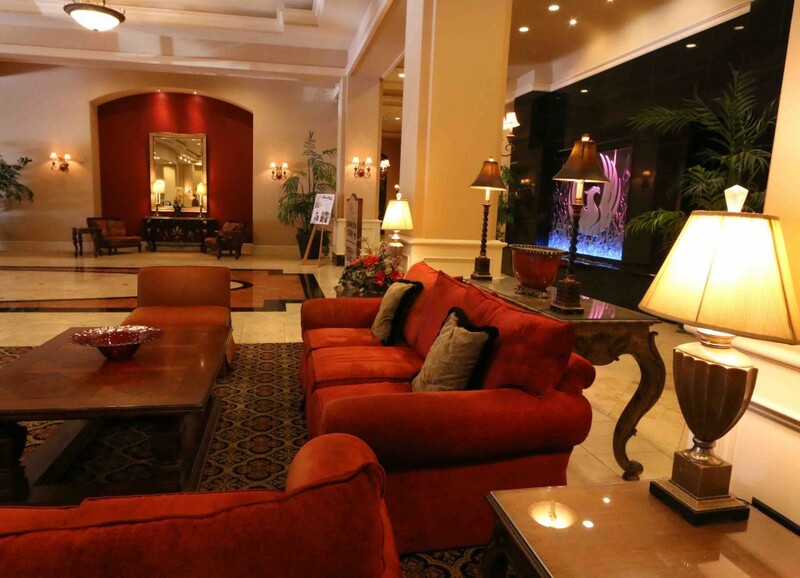 The hotel is conveniently located near shopping and offers complimentary underground parking with easy access to the hotel and Bentley’s Grill. Let me show you around the hotel. 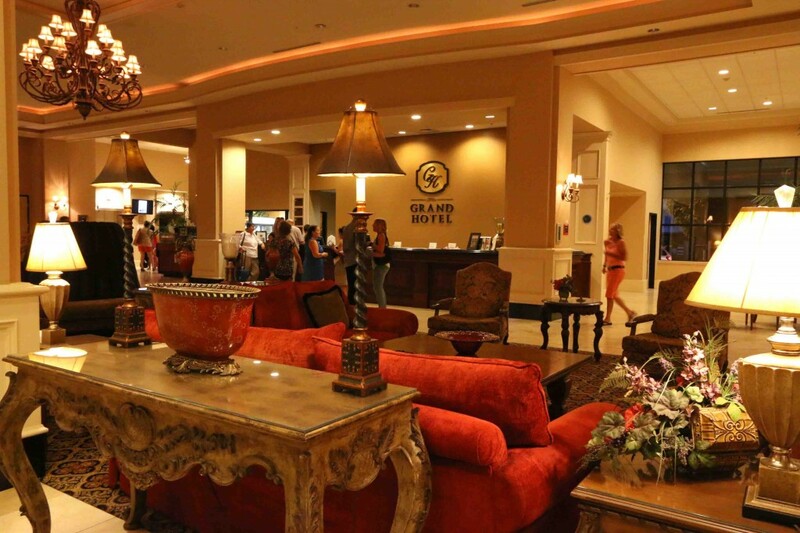 The lobby is simply gorgeous. 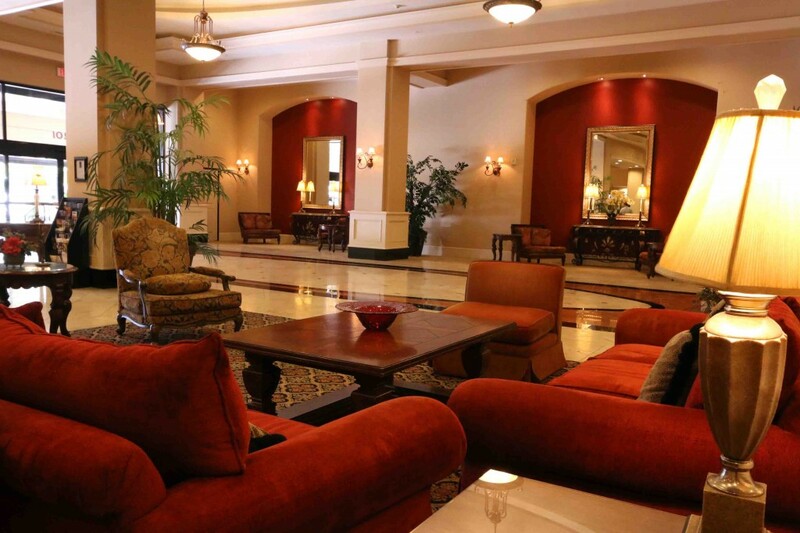 With its plush velvet chairs and sofas, elegant lamps and chandeliers, warm colors and charming decor, The Grand Hotel in Salem is both stately and cozy and is the perfect blend of traditional and contemporary. Old photographs throughout the lobby pay tribute to the hotel’s history. On the same location as the current hotel was the Marion Hotel, built in 1870. It was billed as the “finest and largest in Oregon” as well as the “finest north of San Francisco, with all modern improvements.” Tragically in 1971, 101 years later, it burned down in a great fire. In 2005 The Grand Hotel in Salem was built on the same location, a resplendent tribute to the original historic Marion Hotel. The Grand Hotel in Salem was designed as the flagship property for VIP’S Industries, Inc. who also own the Phoenix Inn in South Salem. 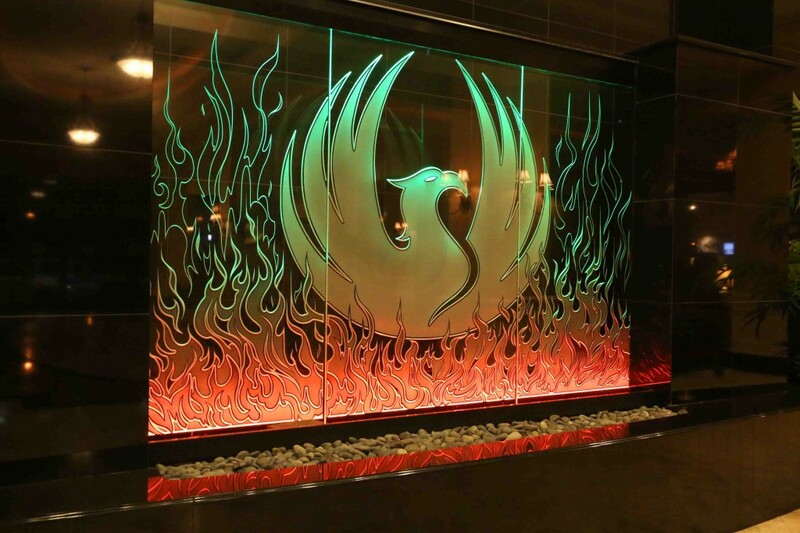 On the wall opposite of the front entrance is an eye-catching, color-changing glass panel depicting the mythical phoenix rising from the burning ashes. Considering the history of the hotel and its predecessor the metaphor is especially fitting: The re-birth of Salem’s finest hotel, risen from the ashes of historic grandeur. Down the hall from the glass-paneled phoenix is Bentley’s Grill, which we’ll get to shortly. In the meantime, let’s take a walk down the hall in the opposite direction. 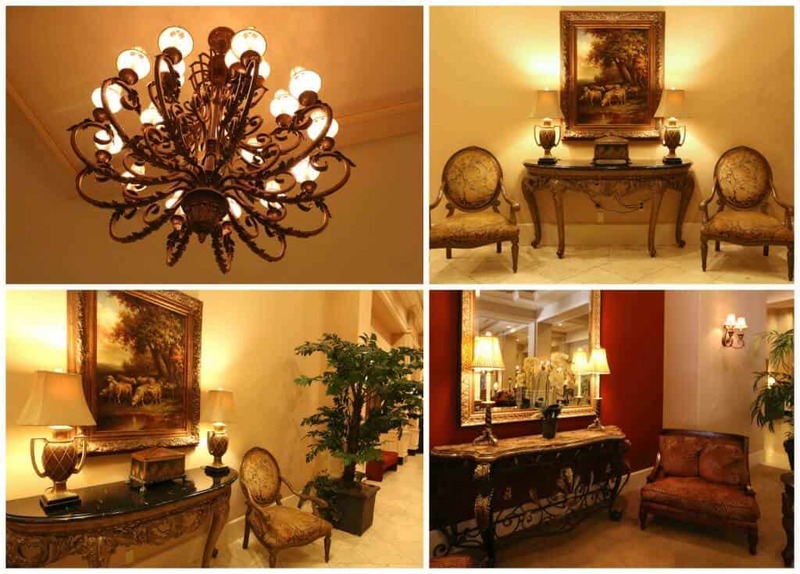 Beautiful chandeliers, elegant furniture and art adorn the main lobby and hallways. The soft lighting creates an intimate ambiance and there are multiple areas to sit down and relax. Something unexpected that captivated our interest was this horse. 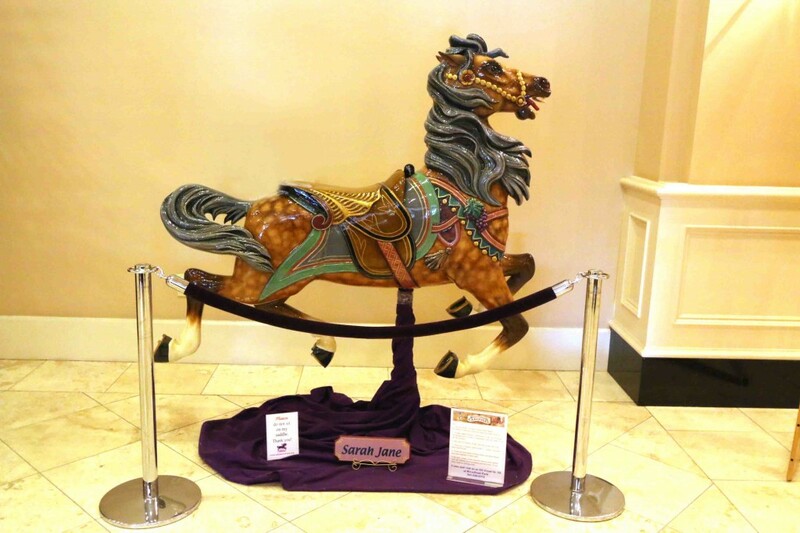 On display in the lobby across from the front desk is one of the wooden horses from Salem’s Riverfront Carousel. We read the sign about the horse and were fascinated to learn the following facts: “It takes approximately 700 hours of carving, 50 hours of sanding and 50 hours of painting to get me ready to go on the carousel.” Isn’t that incredible? What an amazing carousel it must be with 32 of these beautiful custom-made wooden horses on it! Next time we visit Salem we’ll take a detour to visit Salem’s Riverfront Carousel. After touring the hotel and getting things settled in our room, we were ready for dinner. My parents volunteered to eat in the room with the kids so Todd and I could head down to Bentley’s Grill. 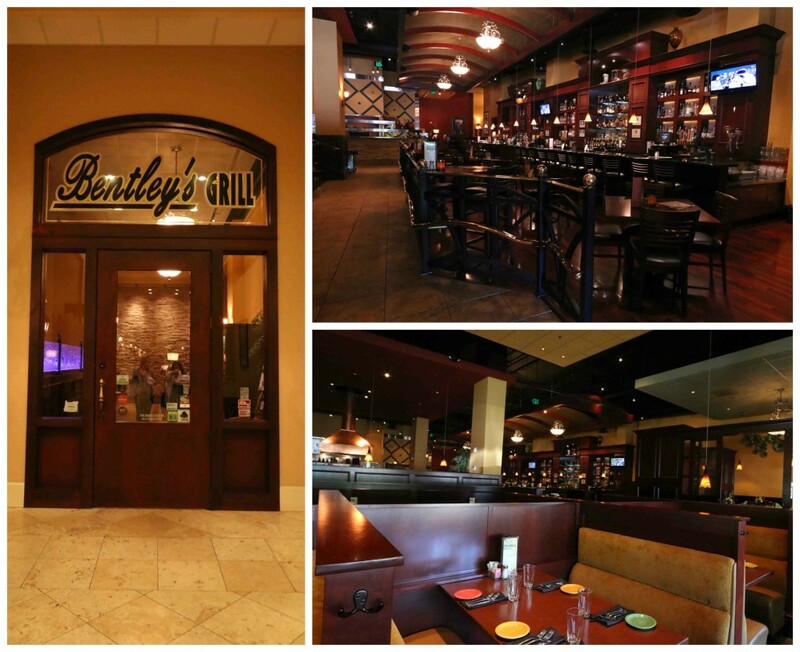 Bentley’s Grill has a very warm and welcoming atmosphere with lots of dark wood and soft lighting. 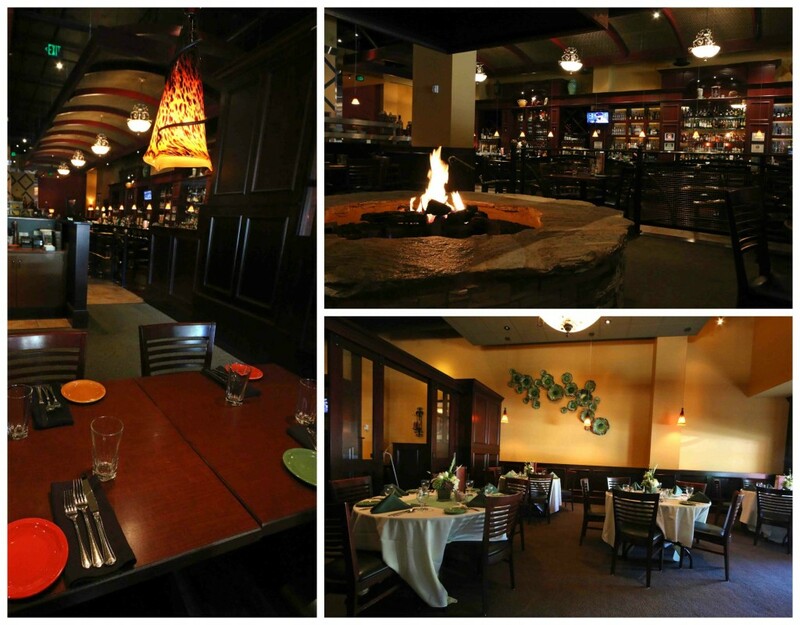 A huge circular stone fireplace in the middle of the front dining section adds to the cozy atmosphere. A separate dining area can be reserved for special occasions, in this instance for an upcoming engagement dinner. While perusing the menu our server brought us some fresh olive bread with herb butter. The quality of the bread at a restaurant is often indicative of the food to come and this delicious artisan bread had us looking forward to the entrees. Both of us were in a pasta mood and two of the selections caught our attention: Gorgonzola Butternut Squash Ravioli tossed with sage–parmesan cream sauce and topped with crushed ameretti biscotti. The second one: Chicken Fettuccine with breast of chicken, broccoli, leeks, garlic, thyme and sun-dried tomatoes tossed with fettuccine in a white wine Alfredo sauce. Both dishes were excellent. We enjoyed the addition of the broccoli, leek and sun-dried tomatoes in the chicken fettuccine. The fresh pasta was perfectly cooked and the creamy white wine Alfredo sauce was wonderful. But as good as the chicken fettuccine was, the Gorgonzola Butternut Squash Ravioli had us mesmerized. Truly, the flavor was incredible. And were it not for the fact that Salem is a 3-hour drive from where we live, we would have been back before now for a second order! After dinner we headed back to our room. We learned that 6 weddings as well as a large state-wide conference were being held in the hotel that night and throughout the weekend. Despite the masses of people on the premises the hotel’s operations continued to run smoothly, seamlessly, quietly, professionally. The staff was ever-ready to take care of any of our needs. Our room was very comfortable. And with complimentary high speed internet, something most 4-star hotels charge extra for, I was able to get a little work done before retiring to bed. The next morning the room was bright and cheerful and, with a night’s sleep behind them, our kids were ready and eager to begin their big day! But first it was time to charge up on some food. For anyone interested in starting out the day with a workout followed by a dip in the pool, the hotel has a fitness center, pool and spa for your enjoyment. We skipped the workout and headed straight for the FOOD! 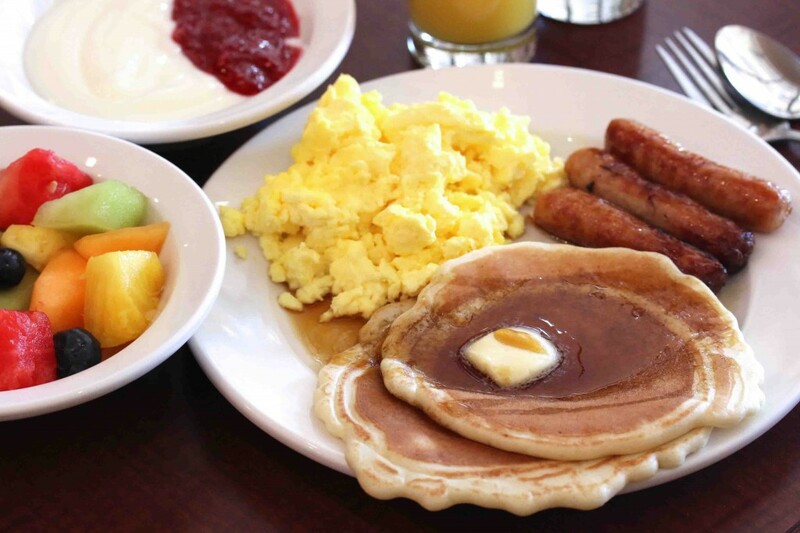 The Grand Hotel in Salem offers a complimentary extended hot breakfast buffet, another rare but welcome feature for a 4-star hotel. The selection is varied and satisfying. Fresh rolls, bagels, cereal, fruit, yogurt, scrambled eggs, sausages, pancakes, etc. The facility is bright and cheerful and the food selection provides you with everything you need to start your morning. 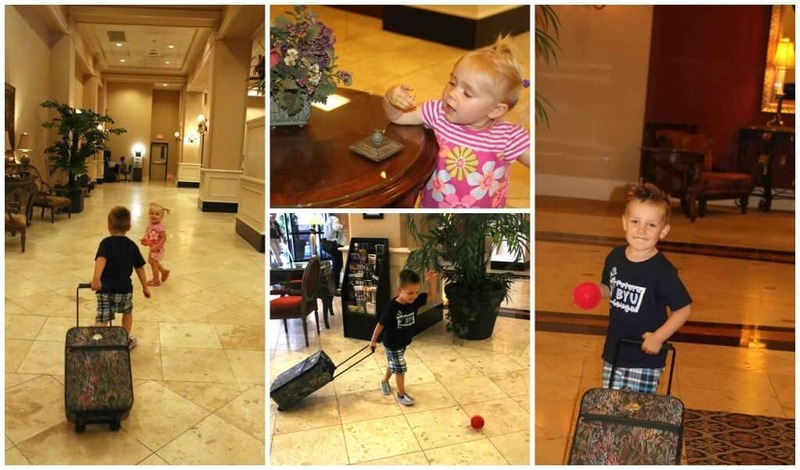 After breakfast we checked out of the hotel, but not before our daughter performed a detailed hotel inspection and our son played lobby-ball. We really enjoyed our stay at The Grand Hotel in Salem and highly recommend it to anyone looking for a beautiful hotel with a friendly, professional and dedicated staff, excellent service, amenities and food. The Grand Hotel in Salem will be our top choice any time we visit the area in the future. Whether you’re looking for a romantic getaway, are into golfing, the great outdoors, or wine tasting, the Grand Hotel offers several package deals tailored to your interests. Click HERE and HERE for more information on Salem’s attractions. For more information on The Grand Hotel in Salem, visit their website. For more information on Bentley’s Grill, visit their website. 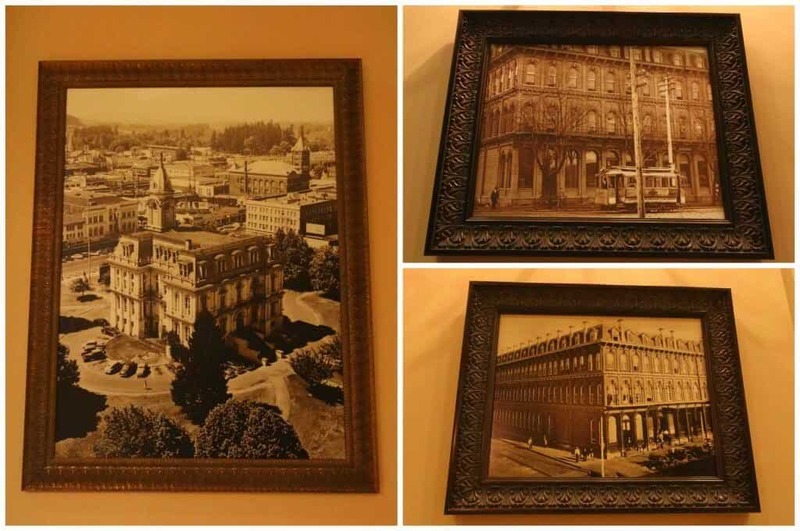 * Very first photo and guestroom bed photo are courtesy of Grand Hotel in Salem. All other photos taken by The Daring Gourmet. * Disclosure: We were hosted for a one-night stay. As always, all opinions are entirely my own. That’s wonderful, Amanda, I’m happy you and your husband have had the opportunity to stay there so often! Thanks for reading and for your input! Oh, and I forgot to mention, Bentley’s Grill IS fantastic. I don’t know how I missed the butternut squash ravioli, maybe it wasn’t offered on the menu at the time, but we’ve eaten there several times and have enjoyed every meal. We were really impressed too, Amanda. We only got to try the two entrees but are looking forward to a return visit to sample more. And yes, the next time you’re there you definitely need to try those ravioli’s – amazing! You’re welcome, Loretta! Yes, the prices really are very reasonable and a great value. I hope you get the chance to stay there! I live just a few miles from Salem and am wondering now how it is that I’ve never been to Bentley’s Grill?? It looks and sounds wonderful. I’m letting my husband know that I’ve got our next date night planned out :) Thanks for the tip, Kimberly! Beautiful hotel and review by the way! 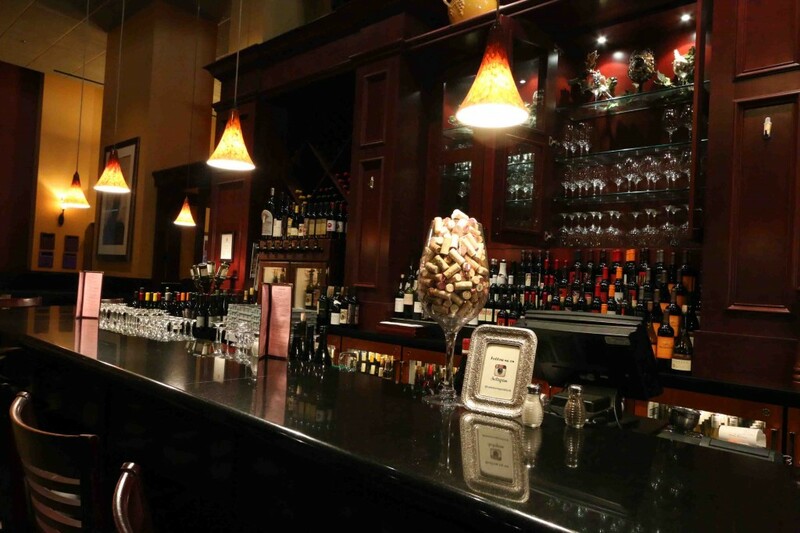 Dinner at Bentley’s Grill will make the perfect dinner date, Corinne! Have a wonderful time and enjoy the food! What a lovely hotel. I’ve passed through Salem many times but have not stayed overnight. I’ve been to the Riverfront Carousel, it is very charming. I had no idea so much work went into those horses, definitely makes you look at things a little differently knowing that, doesn’t it? Thank you for another thorough and informative review, really enjoyed reading. Thanks for reading, R.T., and for your input. We’re looking forward to checking out the carousel next time we’re in the area. Knowing the level of craftsmanship that has gone into it will make the visit even more enjoyable.